The Woodland Lodges, built in a staggered terrace arrangement, are designed to take full advantage of their elevated, south-facing aspect, with the bedrooms and bathroom at ground level and fully-equipped open-plan kitchen/dining area, lounge upstairs with sliding glass doors onto a secluded balcony. All the lodges are now in private hands except for one ('Oak Lodge') which the site owners have retained for letting purposes and which is in prime position at the end of the terrace close to the adjoining field. 'Oak Lodge' - This Visit Wales 4-Star graded lodge can sleep up to four guests in two bedrooms (double and twin). A cot or extra fold-out bed can also be provided if required.The kitchen is fully equipped with all the basic requirements for a self-catering holiday including a cooker, microwave, fridge, freezer, kettle and toaster. The lodge is also supplied with a flat-screen television, bedding, bed linen and towels. The modern bathroom has an electric power shower over a full-size bath. Hot water is provided by an immersion tank and there is a night storage heater and other electric heating in each room for use in the cooler times of the year. As with all the Woodland Lodges, this lodge has its own allocated parking space directly in front. There is more parking space for additional vehicles or trailers elsewhere on the site. 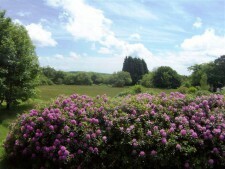 The balcony has a table and chairs and enjoys pleasant views across the countryside towards Carmarthen Bay beyond. Note - Pets are welcome by arrangement with the site owners (no dangerous breeds allowed) upon payment in advance of a supplement. The Orchard Lodges are built in a chalet style design in groups of four. They are all in private hands except for one lodge ('Pine Chalet') which the site owners have for sale but in the meantime it is available for holiday letting. 'Pine Chalet' can sleep up to six. There is a double bed in a loft area and at ground level another bedroom with bunk beds. The open-plan living area does have a sofa bed which can sleep two extra people if required. The kitchen which is to the side of the living area is fully equipped for self-catering with a fridge, electric cooker/hob, microwave, kettle and toaster. There are sofas, flat-screen TV and dining table and chairs. The bathroom has a shower, wash basin, toilet and heated towel rail. Outside there is a patio area with table and chairs and this lodge enjoys the seclusion of a quiet corner of the site surrounded by trees. Pets are permitted by arrangement with the site owners (no dangerous breeds allowed) and upon payment of a supplement. The Garden Lodge is a building which has a small conference/seminar facility at ground level and a self-catering flat with four bedrooms on the first floor. 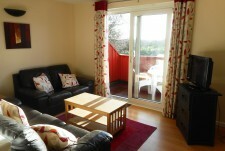 The flat is available for hire by one group or individual rooms can be hired with use of shared kitchen and living area. People wanting to hire the whole flat are advised to book as far in advance as possible to ensure its availability. There will be times when some of the rooms will have been let out on an individual basis. Each of the en suite cubicles have a shower, toilet and wash basin. The bedrooms all have a flat-screen television and tea/coffee making facility. The kitchen is fully equipped for self-catering and has a fridge, freezer, electric oven and hob, microwave, kettle and toaster. The adjoining sitting room has sofas, dining table and chairs, and a flat-screen television. 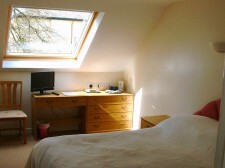 A cot or fold-out bed can be provided in any of the bedrooms if required. Bedding, bed linen and towels are provided. Parking is available close by on the site and guests are welcome to enjoy the grounds. Note - Pets are not permitted in this accommodation.